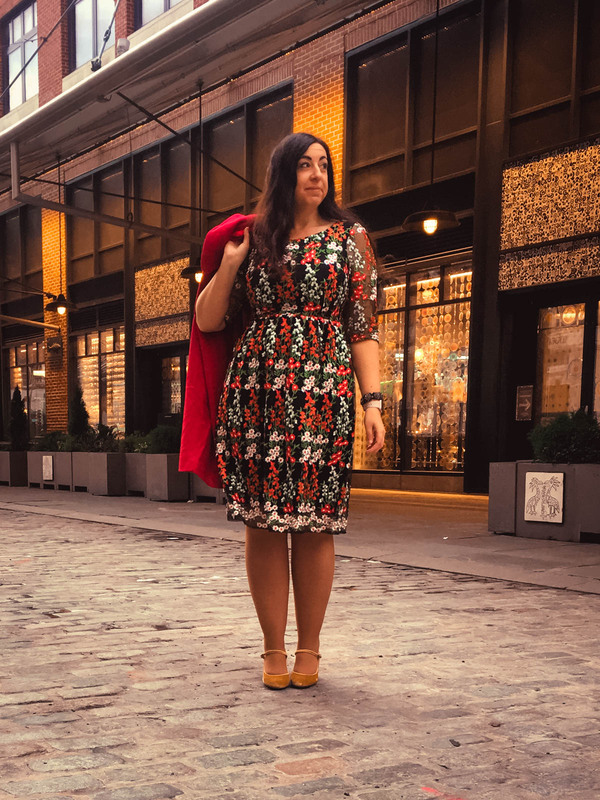 This is a sponsored post for the Modcloth Holiday 2018 collection. 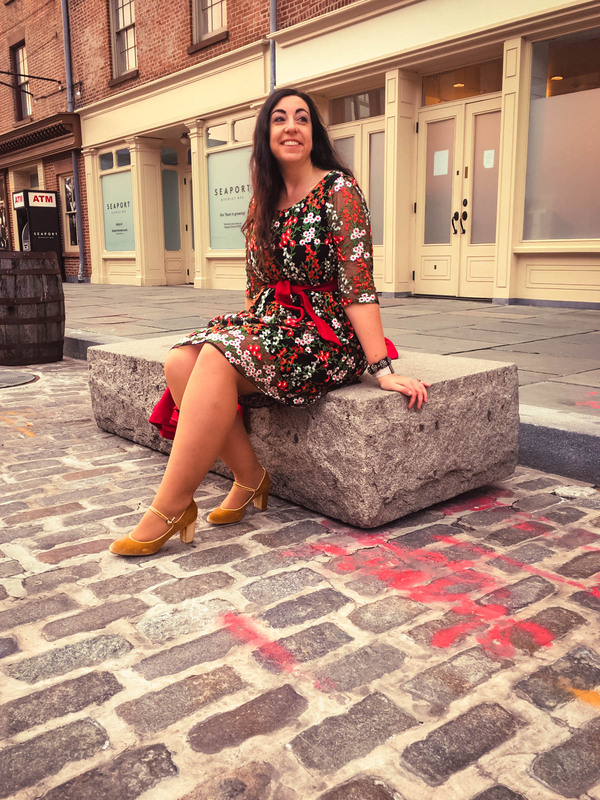 I was compensated to write this post and most of the clothing I’m wearing was provided by Modcloth, yet as always all opinions are my own. Please read this blog’s disclosure post for more info. Where am I finding the cutest dresses for Holiday 2018? Modcloth!! 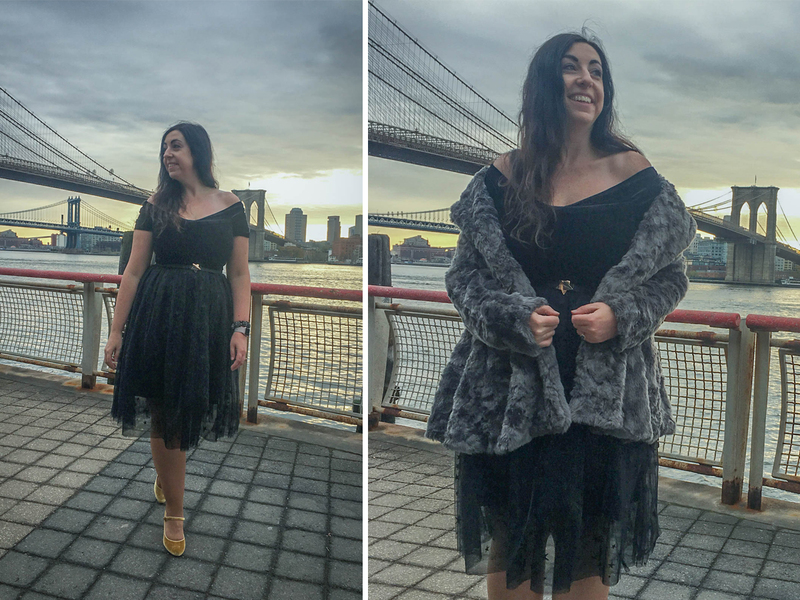 I recently had great success with a personal shopping client picking out a few Christmas and Hanukkah holiday party looks at Modcloth. She looked so stunning and the dress options are delightful and plentiful, so after my client was all set I came back to shop for myself! I’m pleasantly surprised by all the cuteness in the Modcloth Holiday 2018 collection! It has that handmade, unique quality I adore in ultraflattering silhouettes. Their dress section in particular has filled my wishlist up with cute A-line and body-skimming shapes that look great on a diverse set of sizes, skin tones and heights. Best news of all? Right now during Modcloth’s Black Friday promo you can take 30% off your order of $100+ and 40% off your order of $200+!! This promo even works on sale items. That makes holiday outfitting a much simpler equation, don’t you think? It’s not easy picking favorites when the choices are so good. 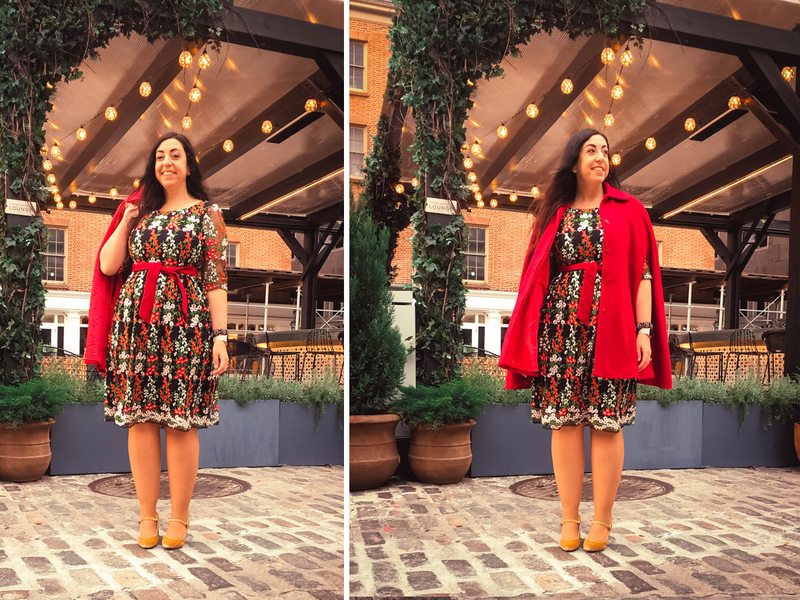 In fact I couldn’t pick just one so this post features OOTDs of two Modcloth dresses I love! Firstly, the Duly Dreamy Embroidered A-Line Dress ($139, on me) is everything I want in a holiday dress! The muticolored floral trails lining the dress remind me of Christmas ivy and holly. The sheer sleeves give me that conservative coverage I’d need for family events or church, while the length is ideal for my height. The dress is lined on the entire bodice. Doesn’t it look so festive on?? I’m wearing a large in the Duly Dreamy Embroidered A-Line Dress ($139). It comes in sizes ranging from XS to 4X! I love how body diverse Modcloth is. And let me tell you that the quality on this dress is excellent. I’m impressed by how well each flower is sewn on, how the pattern matches up well on the side seam and how the waist nips inward perfectly. 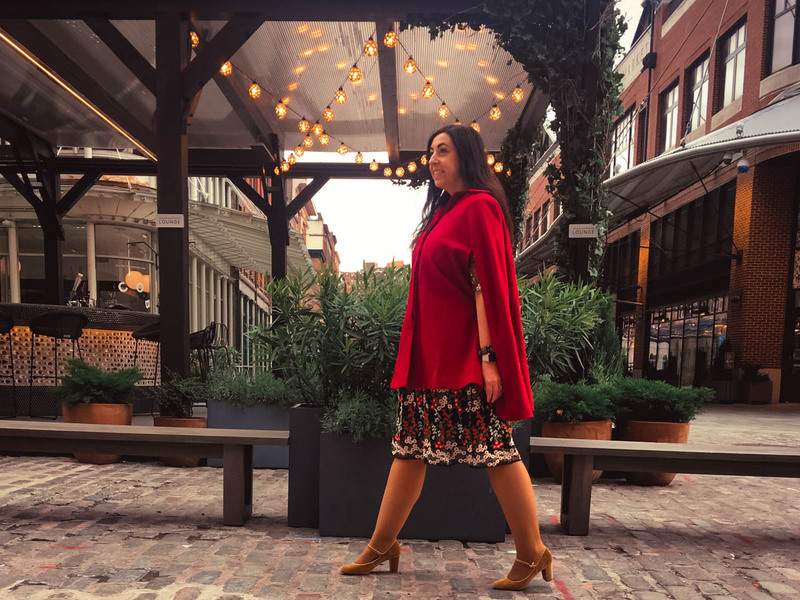 When it came to picking coordinating items for the dress, both the Posh the Limits Wool Cape ($139) and Attention to Excellence Velvet Heel ($79) jumped out at me. The cape comes with a beautiful sash that is a perfect accent on the dress! Or it can be worn as a neck tie a la the product page. The cape itself drapes beautifully. The arm slits create a beautiful silhouette that isn’t too voluminous. For these photos I’m in a UK 14 (US 10). Finally for this first outfit, although the Attention to Excellence Velvet Heels ($79) are ostensibly mustard, the color reads as a beautiful gold on! These heels are made by Chelsea Crew — a brand I love for its quality, comfort and affordability. I’m happy to report that in my usual size 9/40 these are soft, comfortable out of the box and ready to wear all day or night long. They come in a burgundy and grey too. With such success from these heels I’m ready to buy these Chelsea Crew booties and these double-strapped mary janes too! This outfit makes me so happy because I feel like I’m in such a classic outfit! 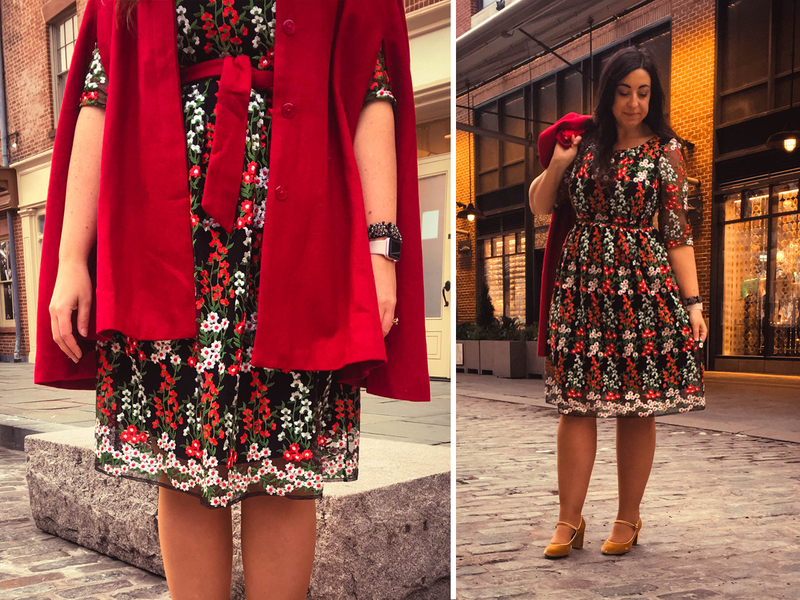 The Modcloth Holiday 2018 collection has so many classic festive dresses to choose from! Below, some of my favorites. But what if your holiday festivities are more party-centric? What if you literally need a dress to party all night, as I do? Luckily the Modcloth Holiday 2018 collection has you covered in this scenario too! Again I found myself in pure delight over all of the options! Many of my party picks at Modcloth come from Chi Chi London, a brand that clearly knows how to arrive at a fête! Some of the dresses I considered for my first up all night holiday event included the Own the Moment Midi Dress ($119), the Admired Stylista Fit and Flare Dress ($149), the Exquisite Elegance Lace Dress in Navy ($175 — omg the two tone amazingness!!) and the Gilded Grace Lace Dress ($175). Stay tuned as some of these dresses are sure to make an appearance soon. In the end, for the particular event I was attending, I selected the Uplifting Aura Off-Shoulder Dress ($119, on me). This dress has an appealingly trendy 90s vibe to it without being specifically “Christmas” or “Hanukkah” (or “Kwanzaa”!) to it. The velvet top feels incredibly luxe and can be worn on or off-shoulder while the starred skirt portion feels so celebratory! You’ll note those same lovely mary janes from my first outfit are back in action here. Except that is for my scooter ride when I switched to darker tights and boots! The red scooter illustrates that the cape from my first outfit would work well here too. For this particular event, I chose a faux fur coat instead for additional warmth on an especially chilly eve. 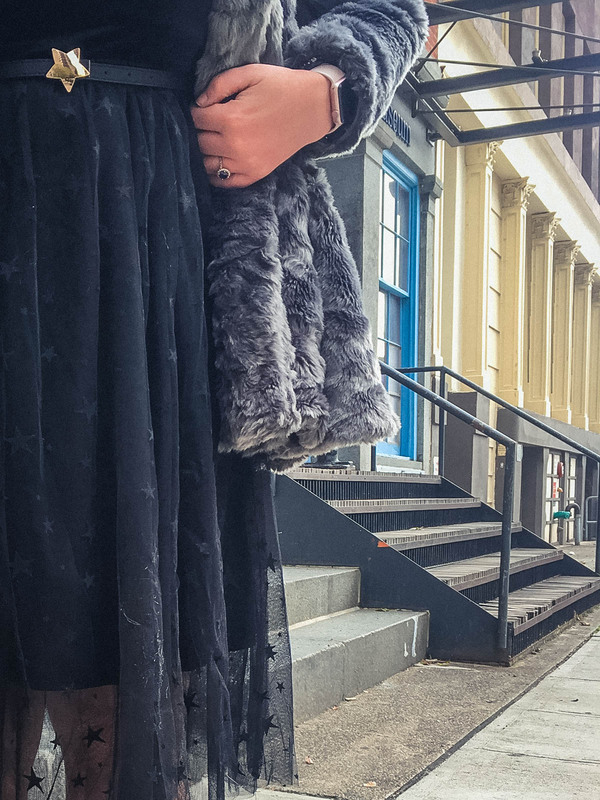 Modcloth’s coat selection will complete your outfit no matter which dress you choose! By dawn my dress still looked fresh as ever! So we headed down to a Brooklyn Bridge overlook for some final snaps. 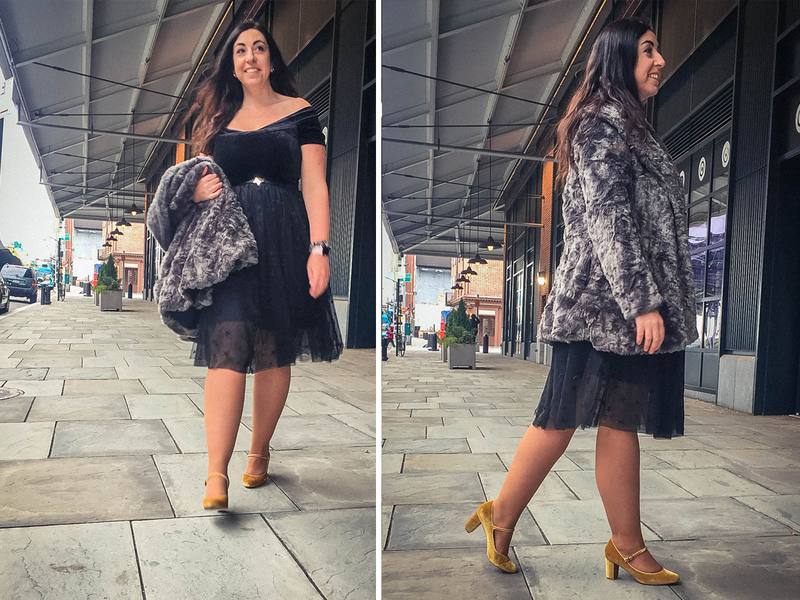 This dress was everything a (holiday) party girl could want! I am now angling for some more holiday party invites so I can try some of my other favorite picks out. Whether you’re doing a small family gathering, a night at church and then an evening at home, or a party out with friends, make sure you don’t buy your holiday outfit without taking a look through the Modcloth Holiday 2018 collection first! And if you’re looking for gifts, the Modcloth Holiday 2018 collection has you covered there too! 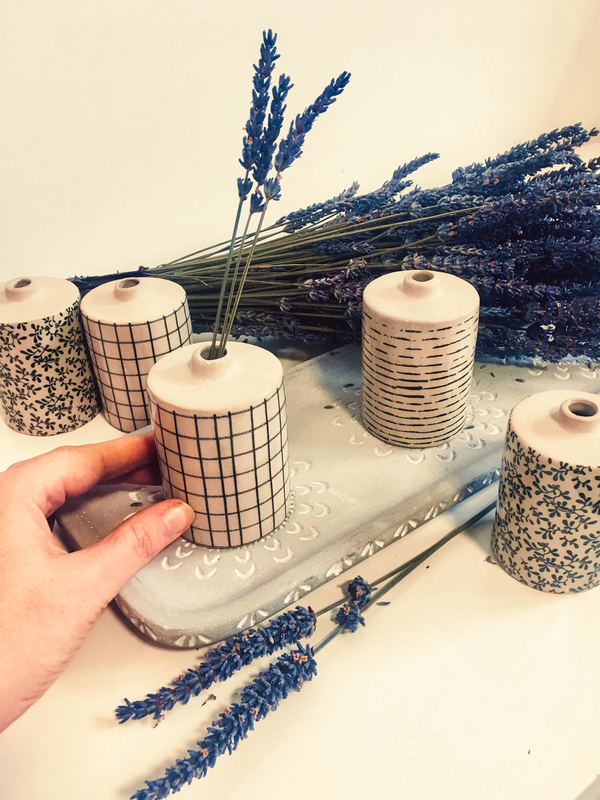 I absolutely adore the Bud, Of Course Mini Vase Set ($30, above). I like it so much I got two…one to gift, one to keep. I highly recommend paging through Modcloth’s cute Holiday Gift Guide. Below, more Modcloth holiday delights sure to please. 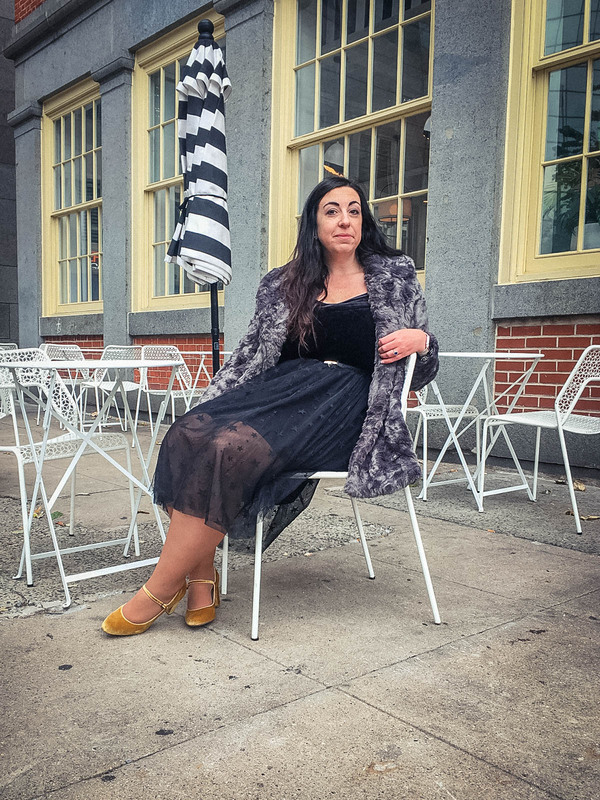 Have you shopped Modcloth recently? Don’t forget about their Black Friday promo going on now through Sunday where you can save up to 30% off your purchase! What are your favorites from this post? That floral dress is so pretty and perfect for Christmas. I had never heard of Modcloth before, thanks for introducing them to me Roxy! Yes!! It is SO holiday ready! I have to rethink Modcloth…..if the quality is good, the prices are great! The quality is GOOD. They’ve really taken steps to up quality and in some cases materials. I’ll see if I can find photos from any of the other girls in this campaign in a bit. Ok ready? I'm about to hit you with a whole bunch! Looking good Roxy, cute pictures!! I adore Modcloth with all their adorable, quirky prints and affordability. They always have the cutest cardis and shoes! I have 3 or 4 more things I'd like to buy from Modcloth now! I'm impressed by their cute shoes and tights, and their dresses especially. Both dresses are so pretty on you! I really like the star belt with your second outfit. I see some items in your boutique worth taking a closer look at. Thanks Missy! Yes I think the star belt is so cute, I plan on wearing it with jeans too! Which items are catching your eye in the shoppable boutique? U look beautiful Roxy!! I’m in love with the red cape!! I’m into green items lately lol may be coz I’m missing them in my wardrobe. Thanks Nam! I totally agree about green — I just bought an entire green outfit from J. Crew. It looks so lovely on! I've missed it. Both of those dresses look so lovely on you, Roxy!! Love the cape too. I've been getting Modcloth catalogues for a few months now, and they always look so gorgeous – I really like the way they put items together. I haven't bought anything from them yet, though. It usually takes me much longer to take the plunge on anything mail order only. Have you ever had to return anything, and if so, how long does it take them to issue a refund? Thank you so much Anthropolitan! I checked with a friend of mine who orders from them often, and she says it takes max a week to get a refund, but often she gets it about a day after mailing her return package. I personally haven't had to return anything to Modcloth yet but one item in my order did arrive broken and they overnighted me a replacement!! I was very impressed by that. The Frosted Elegance Fit and Flare Coat is reminding me of a similar one that we all went craZy over ages ago lol! But seriously the numerous reviews on Modcloth that include photos is heavenly, this is a brand I can really get into. Right?? I love how many photos they share, and how great everyone looks!! People of all sizes, shapes, ethnicities, etc. I am loving that first dress on you Roxy! The second dress is also very nice — love the belt, the dress might be a little too young for me. But both are lovely and I like so many of the dresses you highlighted here. I think I'll place an order to see if I can find my Christmas dress here. Thanks VanessaPeep! Come back and let us know how your order works out. I love the emobroidered dress- such pretty detail! Also the gift guide picks look great – I definitely need to do some holiday shopping at modcloth today while the sales are still on! Yes! Today is the last day to shop with the 40% off. 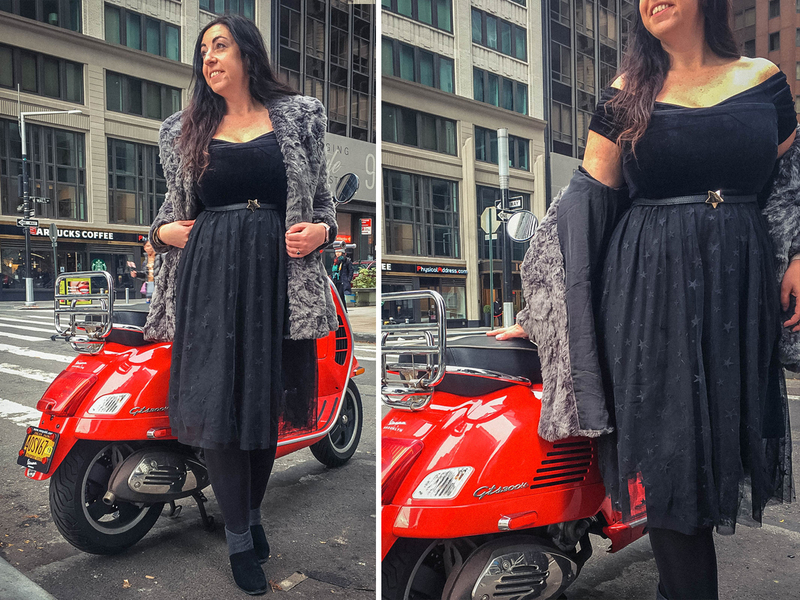 I can't stop swooning over the mod cloth holiday dresses! Both dresses are GORGEOUS! I love the embroidery in the first one and I love the sweetheart/off the shoulder neckline in the second one! Thanks Rach!! I'm impressed by both of them too. To be honest I often forget to browse Modcloth, but every time I do, I ALWAYS find so many things I love. Your first dress is absolutely perfect for holiday season! These dresses are just so stunning and perfect for the holidays! I love the embroidered detailing on the first one, especially with the pops of red! I also love that fun star print on the tulle! They are both so fun to look at, which makes them fun to wear too. You look great in both of those looks. I have never shopped from Modcloth as I am never been sure about the quality. I might have to check them out. I think will find a lot to love. Especially right now. The embroidery on that first dress is simply stunning! I agree Kim!! It's such a classic dress. I never think to shop at Modcloth, but their holiday collection is super cute! I need to remember to check them out more often! I encourage you to give them a go!! I have never shopped at ModCloth, it seems like I need to try! I love these dresses, they are so so pretty! Both dresses are gorgeous on you! But I love those velvet pumps in your first look. These outfits are so cute! I'm loving the first one especially and those shoes! The Modcloth dresses are really nice, but I'm a total sucker for the coats and jackets! Modcloth's dress section is unmatched!! And I'm definitely thinking of getting that slipper and eye mask set for one of my friends! Oh my gosh everything is so cute! That floral dress is perfect on you! I have got to check out their site. I love both of these dresses you wore here. Modcloth? Didn't they close down like 10 years ago? I have never shopped Modcloth! But I saw a few green velvet pieces that I am going to need in my life ASAP! 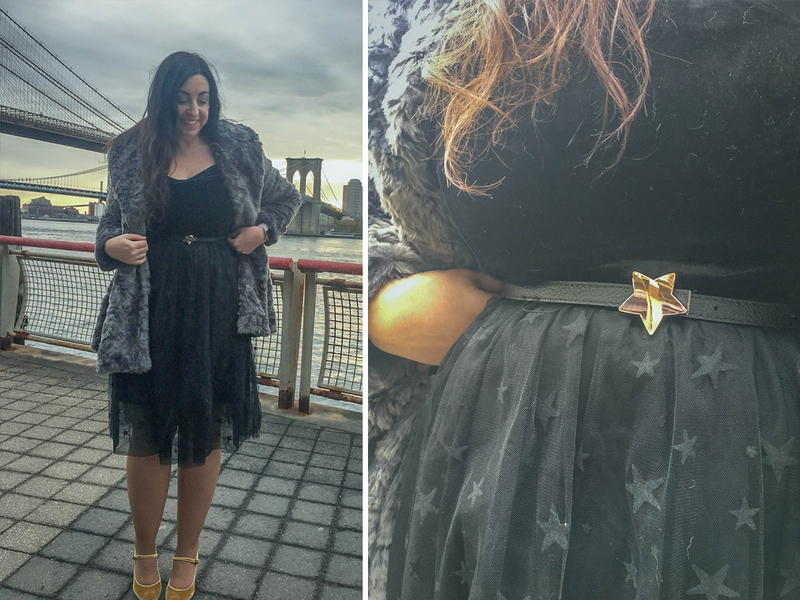 SUPER cool looks – Modcloth has the best selection right now for holiday parties!